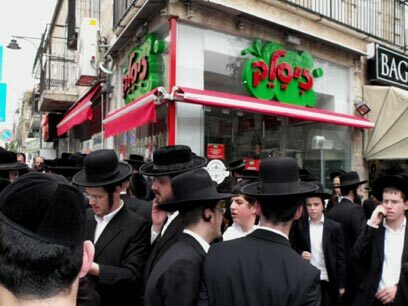 A sign at the ice cream parlor may caution men and women not to lick cones in public, but the warning didn't stop Jewish zealots vandalizing the shop in Jerusalem's main ultra-Orthodox neighborhood. Other businesses in Mea Shearim, including a bookstore and dress shops, have been damaged in night-time attacks by Sikrikim, a group of some 100 ultra-religious men who want one of the holy city's most tradition-bound quarters to become even more conservative. "Promiscuity" reads graffiti scrawled in black at the entrance of a clothing shop selling dresses whose lengthy hemline and drab colors have been deemed too racy by the group. Other stores in the neighborhood, where men wear traditional black garb and women bare little but their face, have had their windows broken, locks glued and foul-smelling liquid smeared on walls. "They also threw once a bag of excrement inside and smashed our windows three times," said Marlene Samuels, manager of the Or Hachaim bookshop, whose bright lights and large storefront sign stand out among smaller and more dimly lit businesses. The shop has been attacked more than 10 times since it opened a year and a half ago, Samuels said. The latest assault was last week when one of the store's branches had its locks glued overnight. Samuels said the shop's owner met with the Sikrikim several times. The store stocks only religious books, but they include volumes published by Orthodox institutions that are Zionist – anathema to the Sikrikim, who believe a Jewish state can be established only with the coming of the Messiah. Named after a small Jewish group which 2,000 years ago fought against Roman rulers and suspected Jewish collaborators, the modern-day Sikrikim strike at night and some wear masks to hide their identities. "They use aggressive tactics and they also ask for protection money which involves paying (a religious inspector) coming in and removing the books he deems unfit," Samuels said. Meir Margalit, a Jerusalem councilman from the secular Israeli Meretz party, voiced concern that the existence of the Sikrikim, although a tiny minority, signified a growing divide among Jews in Israel. "Society is becoming increasingly extremist. With the Sikrikim particularly, who are religiously motivated and rule out any position but their own, one cannot reckon, only fight them," Margalit said. Ultra-Orthodox Jews make up about 8% of Israel's 7.7 million population. With an average of eight children per family, they are a fast-growing population. Many live below the poverty line and keep to dozens of their own towns and neighborhoods. Mea Shearim area is small, less than half a square mile (1.3 square km), and home to about 30,000 residents considered among the most tight-knit and reclusive of Israel's ultra-Orthodox Jews. It takes about a minute to walk from Jerusalem's city center to Mea Shearim, but the dozens of synagogues and Hassidic courts dotting its narrow alleyways are a world away from the cafes and bars of downtown Jerusalem. Sikrikim attacks have also been reported at Beit Shemesh, a mixed secular and religious town with a growing ultra-Orthodox community, about half an hour's drive from Jerusalem. The latest target there has been a religious girls' school. The Sikrikim who reside near the school object to the way the girls dress. Since the school year began in September they have regularly picketed outside shouting out at the students, most of them younger than 12, that they are promiscuous. "They claim to be religious but what they do is a crime against God, against the Torah and against humanity," said David Rotenberg, who works at Or Hachaim. Up the road, the Zisalek ice cream parlor has separate entrances for men and women and a sign – posted at the request of local religious authorities – asking them to avoid any show of immodesty by licking cones in public. "They (the Sikrikim) had a real ball with us," said Guy Ammar, one of Zisalek's owners, describing vandalism similar to attacks against other shops in the area. "But we were not deterred. Residents here told us not to give up and business is going well now." Sikrikim shun the media and have made no public comment about their activities. Police spokesman Micky Rosenfeld said an investigation was under way following two complaints lodged by Or Hachaim Center but no suspects have yet been arrested. Some business owners in Mea Shearim said police has been slow to act, reluctant to get involved in what they see as internal disputes among different religious sects of a closed community. Rosenfeld said that no other businesses have filed formal complaints in recent weeks. A few minutes' walk from Zisalek Ice Cream is the Greentech music shop, where Hasidic music plays in the background and one DVD in a collection of ultra-Orthodox movies is a suspense film about the battles of a rabbi against Christian missionaries. The Sikrikim "do not like anything that changes the character of the shtetl and the way it was a hundred years ago," a worker in the music store said, using a Yiddish term for the small towns where Eastern European Jews lived before the Holocaust. Shlomo Kuk, an ultra-Orthodox journalist from Jerusalem, said the Sikrikim shouldn't be seen as representative of devout Jews known as "haredim." "One thing is certain: they may dress like haredim but what they do is utter sacrilege which blackens the name of the entire haredi community," Kuk said. See all talkbacks "Religious zealots attack 'immodest' shops"